We’ve posted a few times about Will Ryman’s 58th Street currently on view just outside the Phillips. Though it currently resides at the corner of 21st and Q Streets, the sculpture is named for the cross street on New York’s Park Avenue where it debuted earlier this year. Ryman’s 65th Street is now in bloom more than the few blocks away its title suggests. It adorns the beach in a special Art Basel Miami installation through December 4. Take a look at it in the Post‘s slideshow of some of the festival’s most intriguing art. One of the perks of working in a museum is that you get to talk to the curators, and occasionally the artists, who create the exhibitions. So it had never crossed my mind to try our Guide by Cell, since I actually got to meet Will Ryman when he came to install his work 58th Street. But walking back from lunch today I passed those (ominous? fanciful?) 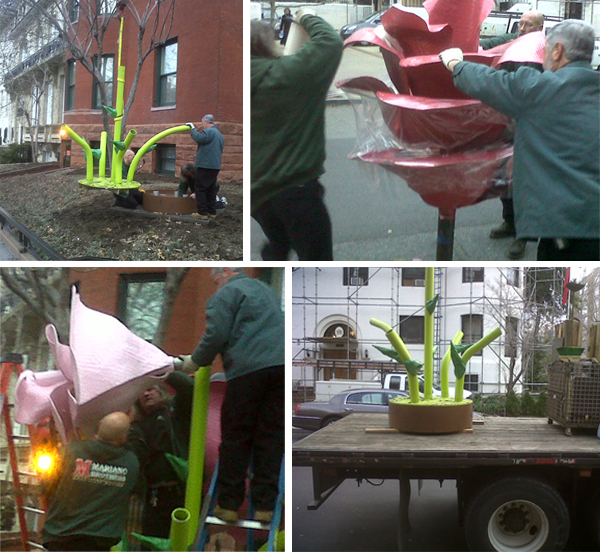 oversized blossoms and bugs at the corner of 21st and Q and stopped to call the number listed below the work. What would I hear? Well, I heard Will Ryman. I have to say, it was kind of a neat sensation, standing there on the sidewalk in front of his sculpture, looking directly in to one of the giant blooming roses and feeling like I had just rung up the artist to ask, “Hey, can you tell me about this thing?” And he did. You can call Guide by Cell stops even if you’re not at the museum. 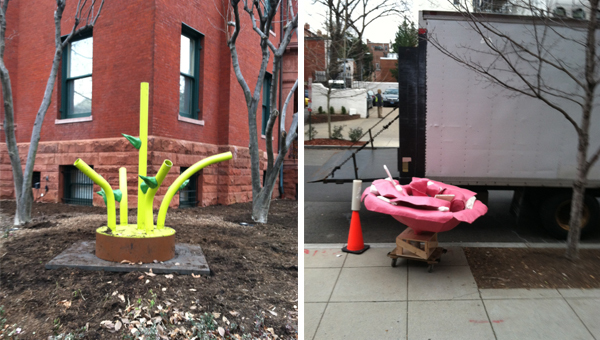 To learn more from Ryman about his sculpture, call 202-595-1839, 40#.